FBN’s Charles Payne on the success of Oxi Fresh Carpet Cleaning and founder Jonathan Barnett. In this Salute to American Success, we’re taking a look at Oxi Fresh Carpet Cleaning and its millennial founder Jonathan Barnett. The company was created in August of 2006 in Denver, Colorado. Eventually, Barnett went on to study franchising in some of his graduate school courses. “I love the business model because you’re creating ownership and giving jobs to other people, but they’re also owning their own businesses,” he said. Barnett said he chose to go into the carpet cleaning business for two reasons. Since starting in 2006, the company has completed more than 500,000 jobs, according to Barnett. 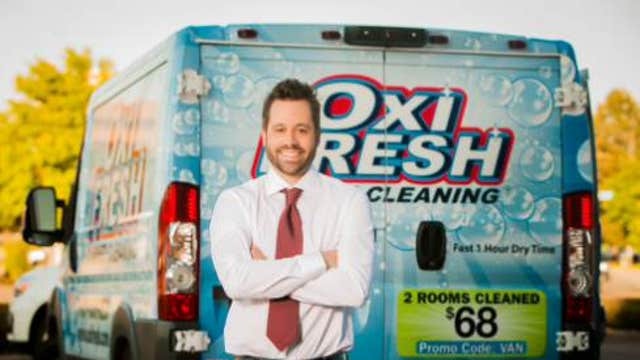 In 2014, Oxi Fresh added 55 units, which he said was “one of the biggest years of growth ever.” Today, the company has about 300 franchises in the U.S. and in Canada. Around 30 of the company’s franchises are located in California, where a major drought is plaguing many areas of the state. One of Oxi Fresh’s goals is to be an environmentally-friendly business, according to Barnett. Looking ahead, Barnett said his plan is to add around 50 units per year over the next five years.